Above photo is from 1970. 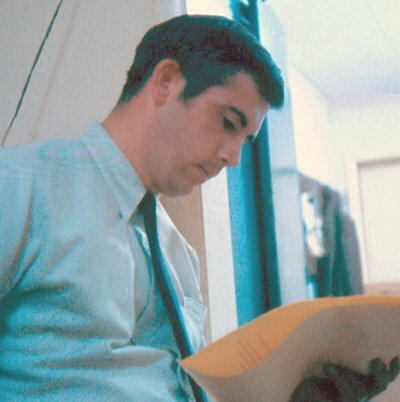 Jim was News Director and anchor for WAAY-TV in 1970. Moved to Nashville December, 1970, worked ten years with the ABC afillitate followed by 21 years with WSMV-Channel 4 (NBC). 1970. Jim Travis with Bill Vance, then chairman of the Alabama Democratic Party. Vance later became a federal judge. He was assassinated at his Birmingham home by a letter bomb. 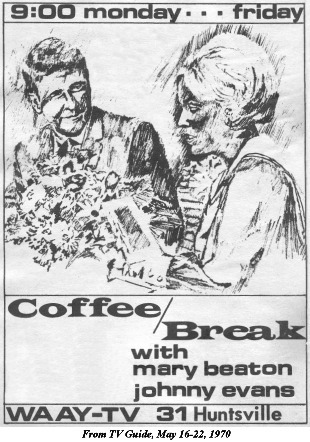 May 16, 1970, TV Guide full-page ad for Coffee Break with Johnny Evans and Mary Beaton. The 30-minute program appeared Monday through Friday at 9:00 a.m. Cover article in this issue was by Vice President Spiro Agnew, advancing his criticisms of network television. 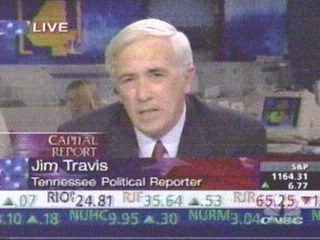 12 Feb 2003 Travis on CNBC's Capitol Report re: Sen. Fred Thompson decision not to seek re-election. Jim Travis, WAAY-TV News 1969-70. My first impression of Channel 31 was not very good. It was the week after Christmas 1960, long before the Smith family took over. Huntsville's population was still under 100,000. Our family had just moved from Oklahoma. I had a little trouble following the thicker accents. In our unschooled minds, Bud Wilkinson was the great man of football. We didn't know much about Paul "Bear" Bryant and couldn't figure why 'Bama had an elephant for a mascot. That would change. In short order we learned to forget the elephant and just count the victories and have pride and faith in the country's new premier football team. On Channel 31, a local entertainer did a good imitation of a mule. The late newscast went 15 minutes. The anchor also had to do a live commercial. When he finished, the screen faded to black and he would reappear in the anchor chair. We wondered how he did that so fast. One night the screen wasn't blank long enough. We caught the newscaster jumping feet-first into his chair to finish the news. Now we knew the secret. That was Huntsville TV in 1961. We had a good laugh and bought a big antenna to watch Nashville and Birmingham stations. They were more like what we'd been used to in Tulsa. Cotton balls dotted the roadsides near our house. Rickety green city buses didn't run very often. Windows rattled from rocket tests miles across town. That was the extent of Huntsville excitement. I soon left for college and got into radio, never imagining that eight years later I'd drive up Monte Sano mountain to start TV life at that station. It was in Anniston, around 1963, that I first met Adrian Gibson. Even then his can-do attitude was an example for the rest of us. My first week at what was now WAAY-TV was in June of 1969. I was led to a studio set to anchor the early news as fill-in. It was the first time in front of a camera, except maybe for an audition. One of the studio crew showed how to string the microphone. The mike was the size of a salt shaker, which is what it was nicknamed. The lights were blinding and hot. By the end of the first newscast, a wooden performance, I doubted the job would last a week. I would surely regret leaving radio. M.D. must not have watched too closely because he kept me on. The TV life stretched another 33 years. You had to work in newsrooms of the 1960s to appreciate how primitive they were and how today's equipment is mind-boggling by comparison. Five people made up the news department: two reporter/anchors and three photographers. One night I was anchoring the 10 p.m. news. M.D. didn't show. Frantic, I ran to the newsroom during a break, grabbed some weather copy and read it, half out of breath, standing off-camera away from the green map. It was a cold, wet night. 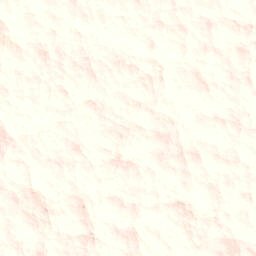 As I mentioned rain, a steady drip fell from the ceiling, in front of the map and to the floor. Anyone at home could have seen it. It was the first and last time I ever did TV weather - the last time I ever wanted to. Dan Akens had left WAAY-TV for NASA some time before. I met him a few times and was introduced to his witty caption-writing. I might have caught him doing news, when I worked radio in Anniston as a college student. As fate had it, in the next twenty years we would work at the same TV stations twice. I never seemed to shake him for long. Dan's time at NASA and later at WSB-TV evidently turned him into one of the best "big story" coordinators I ever met, terrific at marshalling resources. 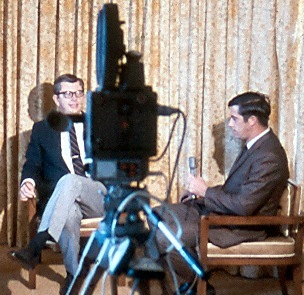 In the late sixties, TV newsrooms were switching to color film. Channel 19 had made the switch by 1970. We still used Tri-X black and white reversal film, developed in a small Kramer processor in a closet near the big studio. All of us learned to use it but Eric, then chief photographer, did much of the processing. The sole film camera was a bulky Auricon. Everything was heavy - the camera, its battery, the lights, their batteries, and the tripod. Light bulbs would often blow just as an interview or a news conference was beginning. That could be embarrassing if you were at Werner von Braun's news conference with the world's press lining both sides of his long conference table. Film costs were budget-killers. After becoming news director in 1970, I recall a meeting at MD-III's home in which we all discussed the possiblity of going straight to video tape. It would be expensive but would cut out film entirely. The downside was that existing portable video gear was even bulkier than film cameras. It was used mostly on network sports events, in black and white. As with other stations, WAAY would not switch to video cams until years later. What impressed me in 1970 and still does today is how far-sighted the Smiths were on this. Two advantages we did have were the twin-engine plane and the boat, which M.D. was quite willing to use for a good news story. Through the years, a fairly large body of tales has developed around the station and it's people. For me it was TV baptism. It was a great time to live in Huntsville, when folks at Marshall helped put a man on the moon and would celebrate some of their successes with rallies at the courthouse square, events we covered live with equipment borrowed at least once from a church remote. Whatever was needed, Cactus would find a way. That period is as memorable as high school is for most. Our first TV or radio jobs, our first paying jobs, folks who give us the chance to make good, are what we remember best, next to memories of our families, because they become as family. We all start somewhere. WAAY-TV was as good as any, the experience as valuable as we worked to make it. I remain grateful for the year and a half I spent there. No less satisfying was learning in later years how WAAY-TV News had grown in size and audience. There have been lean times and good times. The real job, to give viewers good information, has not changed one bit. One thing for certain: we never want to go back to those days 40 years ago when a station could get by with one news reader, who also did a live commercial, who occasionally was caught jumping back in the anchor chair after a fade to black.